When you play at Dotty Bingo, you can be assured of three things: great games, big prizes and a really safe place to play. What’s more, this is the perfect site for those who enjoy the more social aspect of bingo, as the Dotty Bingo community is a really active one. There really aren’t many things to complain about when you play at Dotty Bingo, which is why so many people are now starting to spend more and more time at this site. You can find out more about Dotty Bingo when you continue reading, so take a look below and see why you should be playing there! The welcome bonus at Dotty Bingo isn’t hugely generous. This is because you’ll simply receive a 100% first deposit bonus, which can be worth a maximum of £50. There are no free spins on slot machines, and you also won’t find any free bingo offered to new players. There’s a 50x wagering requirement attached to the bonus funds, which is pretty high, and you’ll only have two days to spend your bonus funds. Please remember that you can’t claim this welcome bonus if you deposit using Neteller or Skrill, which is something that is becoming more and more common at online casino sites. Dotty Bingo is quite a simple looking site. This isn’t a complaint though, as the simplicity means that it’s incredibly easy to use and is perfect for a new bingo player. As the name of the site suggests, you’ll find plenty of dots in the site design, which features a red and white colour scheme. The homepage is slightly strange, as it doesn’t show the different games on offer, and there are no links for non-members to use in order to find out what games are offered. Overall, we like the look and feel of Dotty Bingo though and we think that you will too! Microgaming are having a resurgence in the online bingo world, offering bingo software to a number of different sites. This is the software you’ll find at Dotty Bingo, and it means a couple of things. Firstly, there will be plenty of people in the rooms looking to play and chat, as Microgaming software is now used at a variety of sites. It also means that the software will be incredibly easy to use, meaning that you’ll be able to play with ease. You’ll also find one room running on the Broadway Gaming network. But what about mobile players? 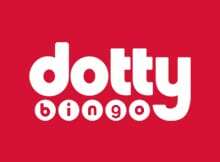 Well, there is no Dotty Bingo app, however you’ll find that the mobile site is an exceptionally good one – just as you’d expect from a Microgaming site. The site will adapt to fit any mobile screen, from the smallest smartphones through to the largest tablets, and mobile players will be able to play a great variety of different games. Mobile prizes are impressive as well. There are a few different games offered at Dotty Bingo, meaning you’ll have the choice between playing 75-ball and 90-ball bingo – the two most popular bingo variations in the world. If you’re searching for the biggest possible prize, you should head to the Broadway Room, as this often has a really big progressive jackpot. Not got time to play for long? If not, pay a visit to the Speed room, which offers super-fast games and an incredible level of excitement. Unfortunately, those looking to play free bingo won’t be able to at Dotty Bingo – something that could put off new players. Most other sites have free rooms, and these rooms are the perfect place for new players to learn the game without risking their own money. We would like to see Dotty Bingo add free bingo games as soon as they can. Looking to take a break from bingo and play some slots? If so, you’ll find plenty of them at Dotty Bingo. The best-known slots at this site come from Microgaming, and they include Immortal Romance, Game of Thrones and Thunderstruck II. There are also progressive jackpot slots at this site, and these can have jackpots that are worth millions and millions of pounds. As you might imagine, the progressive jackpot slots are incredibly popular with players! You will find that there are Slot Sprints at this site, and they are loads of fun. Nearly every day sees a new leaderboard start, and you’ll win points every time you manage to spin in wins. There’s a prize pool of over £3,500 every week, plus loads of free spins are also offered. Can you beat the rest of the field and claim your prize? Depositing is really simple at Dotty Bingo, however there aren’t loads of methods available. You can deposit by credit/debit card, Skrill, Neteller and Paysafecard. This means that PayPal can’t be used, nor can you deposit using your mobile phone bill. There are no fees for adding money to your Dotty Bingo account and all deposits are credited to your account instantly. The minimum deposit at Dotty Bingo is £10. You can use all the available depositing methods to withdraw funds, aside from Paysafecard. Withdrawals aren’t instant – instead, they generally take around 48 hours to process. During this processing period, you’ll be able to cancel your withdrawal request. Withdrawals don’t cost anything, regardless of the method you choose, and the minimum withdrawal amount is £20, which we think is slightly too high. Dotty Bingo: it really is a fantastic place for you to play. The welcome bonus isn’t the most spectacular you’ll find, however the fantastic games – including both bingo and slot machines – make up for this, plus you’ll find that you’re incredibly safe when you play. Depositing and withdrawing is also incredibly easy. Now all you need to do is head to this bingo site and sign up. Once you begin playing at Dotty Bingo, you could find yourself winning some massive prizes! Customer service is easily accessed through the site, either via live chat or e-mail. The live chat is available 24 hours a day, 7 days a week.